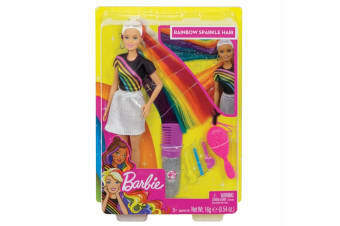 With the Barbie Rainbow Sparkle Hair Doll, young stylists can create colourful, shimmering hairstyles for Barbie. Her long hair can be styled beautifully with a rainbow of colour and sparkles – get creative! Style a look, take it down and style another — there are so many styles and stories to explore with the Barbie Rainbow Sparkle Hair Doll.